In large mixing bowl beat milk, oil, and eggs until blended. Then slowly add corn meal mix and stir until blended. Grease a nonstick bread bowl pan thoroughly. I pour the oil inside the small space that makes the bowl then using a paper towel covered in oil, coat the entire inside, top to bottom. ( you don’t want it to stick when you remove the little bowls.) After greasing pan, spoon corn bread batter into bowl, slightly below fill line, filling all of the bowls. (mine makes 6 at a time) Then tamp pan on counter top to make sure there are no bubbles in the batter. I bang it on the counter pretty hard, about 3-4 times. 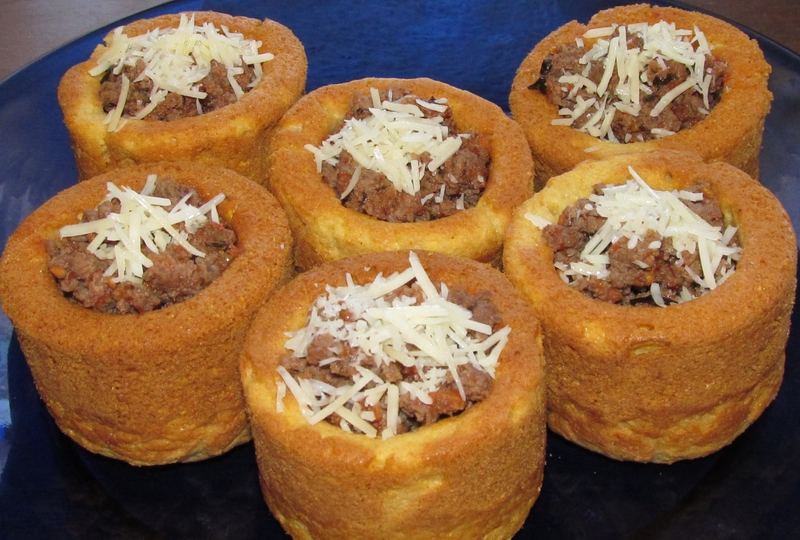 Bake for 25 minutes or until completely brown and loose around the sides of the little cups. Remove from oven and let cool for 15- 20 minutes before trying to remove bowls. Then slide a plastic knife around the edges of the bread, being careful not to cut through the little bowl. Gently twist each bowl to loosen and invert over platter or counter. Bread should slide out. Please note: this is not my corn bread recipe I have used in previous posts, although you could use that one instead. This one is Bob’s Red Mill Cornbread Mix. Just got the new recipe post on the party bread bowls. Where did you find your bread bowl pan? Michelle, I got mine at Bass Pro, a couple of years ago. It is Better Baker brand, they do have an online store. I will look them up and try to post it tomorrow.